Home » Uncategorized » Art Yarn Spin Group – Epic First Event! Art Yarn Spin Group – Epic First Event! So yesterday is still aglow in my heart today. It is such a lovely feeling as a spinner/fiberista to have a houseFULL of like-minded people, it was abuzz with talking, laughter, excitement, ideas, and sharing. This is truly a great community! It was a big pleasure for me to share my space and time with everyone in such a productive and fun way. Pictured here are Hetty, Lia, Marijke, Caitlin, and Monique, while we were chatting with Pam and friends! 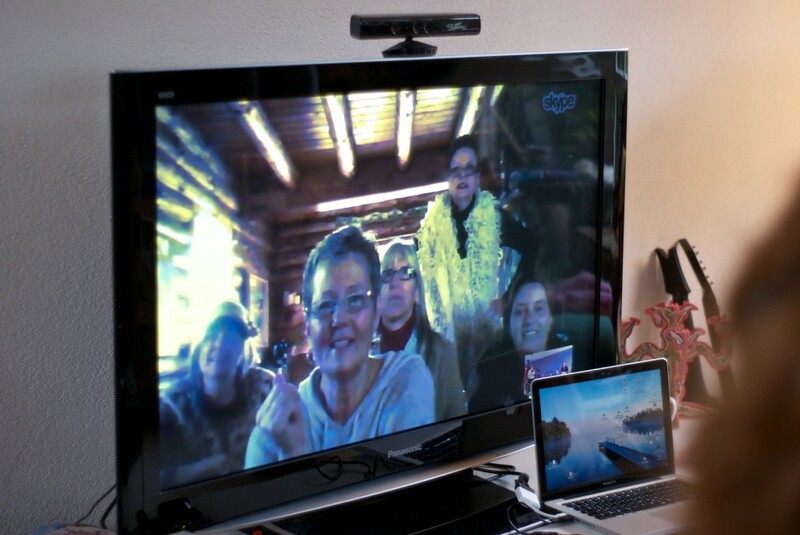 An added bonus on top of this was the (glitch-free) Skype session with the equally fun and talented spinning group that meets at Pam Blasko’s Dreams Come True Farm in the USA! Whoot! 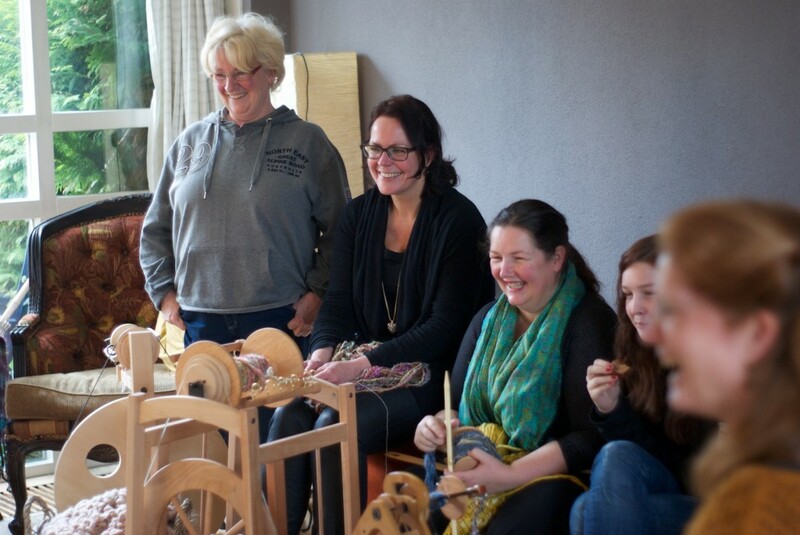 I will keep all the juicy details of our exchange for the Spin Artiste guest post, but let me just say this, on our side of the ocean there was much admiration for the women farmers we spoke with and information swapped about the different fibers we all have access to in our respective countries. We learned, shared, and talked fluff, what could be more perfect than that! 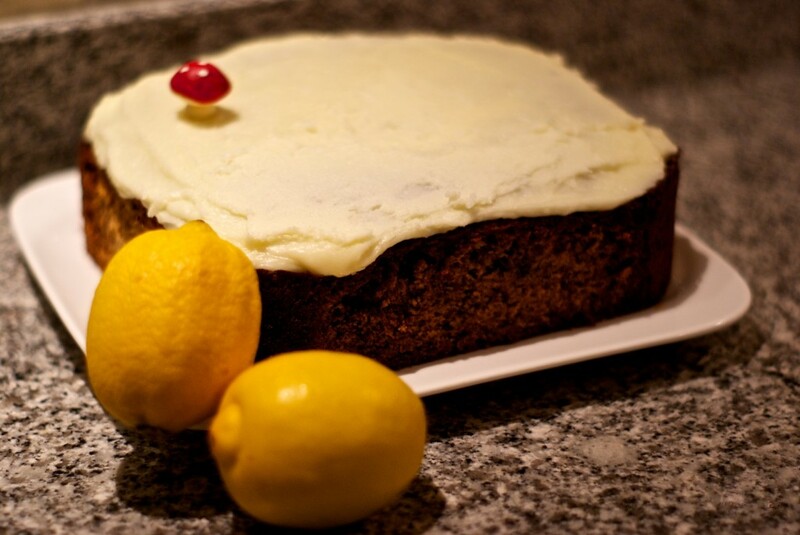 Ok so the next mention goes to the cake… firstly, Monique made a gorgeous loaf that was all winter spices and nutty and lovely, thank you Monique! I finished off the last of it with my coffee this morning. I also made a cake and a number of people requested the recipe. There is a little story behind it… I ‘might’ just occasionally mention online that there are a few things I miss from New Zealand, and some of those things include food items. Possibly all of those things. So you can imagine my complete delight when I recently had a package arrive with a spare part in it from Majacraft, and discovered that not only did it contain my spare part but also some baking soda (hard to find here in baking quality), a little classic NZ choc, and a Banana cake recipe from a well known kiwi cook. I am very grateful to Glynis for her thoughtful additions, I know how busy things are at Majacraft! Ok so the choc didn’t make it past the end of the day, but I did instantly decide that the Banana cake would be the perfect treat to share with the Spin Group! If you scroll to the end of the page I have reproduced the recipe for you here. Before that though, the most important part – the list of people and online links to them so we can all keep in touch across the planet! These are in no particular order and if I missed anyone please leave a comment below with your link/page? Annelies, who impressed us all by spinning what looked like an entire Alpaca on her giant bobbin like it was just a normal thing to do while we were all jaw dropped by it! Marijke, so lovely to meet properly after a brief Etsy encounter in Eindhoven and knowing each other online only, what an inspirational person! And of course Marijkes very talented 15 year old daughter who is not only an accomplished spinner but she also shared her amazing crochet work too. Karen, another new friend who is making some lovely yarns! I’m really looking forward to seeing you again at the workshop in April Karen!! Hetty , so nice to see you again! Already a Majacraft sister twice over, and I can see you and I are going to share some fun with weaving! Corry, who sat here quietly spinning the most beautiful yarn, and has an online shop with another person selling their yarns! And that was all of us! It will be great to all keep in touch everyone we met at Pams, I know some of us are already connected via Facebook, and its fantastic to be able to put a real face to the names and hear your voices. Lets do this again soon. Ok and here is the cake… For Dutch bakers, if you go to your local Toko you ‘should’ find baking soda there of reasonable quality. If not let me know and I can bring some to share with you to the next meeting. When you add it to the hot milk its really cool, it instantly fluffs up! Preheat oven to 170°C. Line a 23cm round cake tin with baking paper or prepare 4 x 10cm tins (recycled large 425g tuna cans are perfect) or 12 muffin tins. Beat butter and sugar until creamy. Beat in eggs and vanilla then bananas. Dissolve baking soda in hot milk and add to mixture. Sift over flour and baking powder and fold in. Spoon mixture into prepared tin(s) and smooth top. Bake until a skewer inserted in the centre comes out clean and the top is springy to the touch. One large cake will take 50-60 minutes, allow 45-55 minutes for 4 medium cakes and about 20 minutes for muffin-sized cakes. Cool in tin and ice when cool. Store in a sealed container in a cool place for 2-3 days or wrap un-iced cake and freeze. Beat together butter, lemon juice, icing sugar and ½ tbsp hot water until creamy. I wish I lived closer also…sounds like a road/plane trip for me….. Sorry I missed it, maybe next time? How wonderful, connecting so much fibery inspiration from one continent to another!! AND the toadstool on the cake!!! Being with like-minded friends makes any day great!! It was really a great day, and i loved your cake too Suzy.